Minnesota Rising: You're Invited: Small-Staff New Year's Celebration! 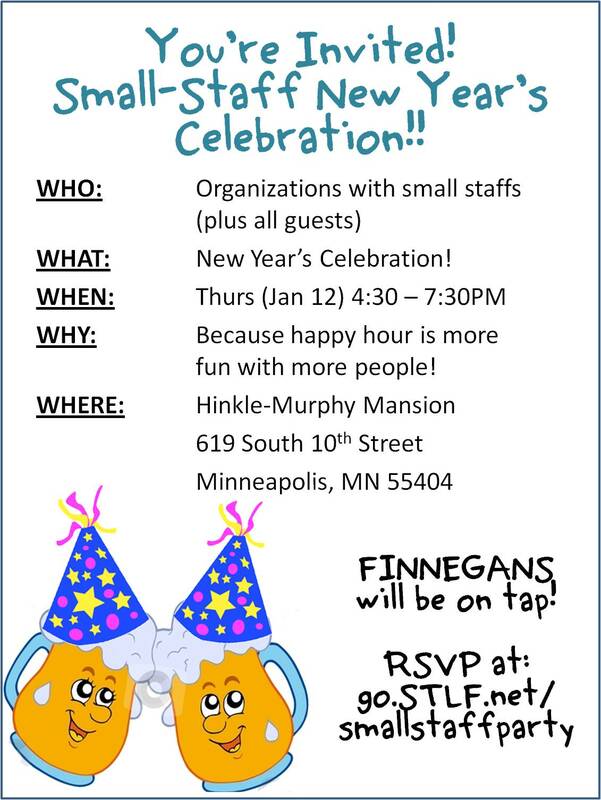 You're Invited: Small-Staff New Year's Celebration! Even in the midst of the start to a brand new year, some familiar things return to us: the State of the Union address, Rev. Dr. Martin Luther King, Jr. Day, and of course, the Students Today Leaders Forever (STLF) Small-Staff Celebration! Stop by next Thursday to make their New Year's happy hour even happier! If you're booked that night, feel free to check out their next Under the Hood HH to learn more about STLF's work to reveal leadership and experience what it's like to go on a Pay It Forward Tour. All in 60 minutes! In 2008 we started hosting SMALL STAFF celebrations. We figured the company picnic with 4 people, and the holiday party with 3 people was not quite the same feel as in larger organizations :). What: Come hang out, meet some other organizations, have a FINNEGANS beer, and snack on some food. Guests are welcome and again, feel free to pass this on!